World number one Rory McIlroy beat Tiger Woods by a single shot in their head-to-head match over 18 holes at the Jinsha Lake Golf Club in central China. The 23-year-old, who was runner-up to Peter Hanson in the BMW Masters in Shanghai on Sunday, had two early birdies and was two ahead at the turn. 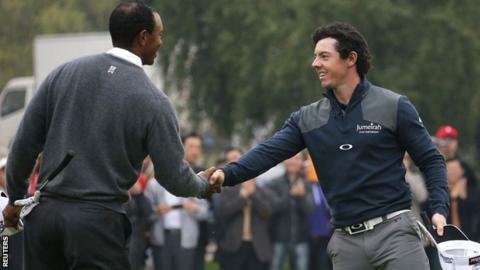 Woods, fourth behind Nick Watney in Kuala Lumpur at the weekend, finished with a four-under 68 to McIlroy's 67. It was only Woods's third loss in 11 matches against the Northern Irishman. The players were greeted by drum majorettes, fireworks and speeches from local dignitaries before sounding a ceremonial Chinese gong and having their handprints and autographs immortalised in clay. A frenzied gallery assembled for the duel, with a prize pot reportedly worth $2m (£1.25m). The quiet calm of a regular golf crowd was replaced by fans refusing to stand still as the players took their shots, continually taking photos, and allowing their mobile phones to ring. Some were even tackled to the ground as they attempted to outsprint security guards. Woods, who chipped in at the short 12th to reduce the deficit but saw his chances fade with two dropped shots, said of the experience: "It was certainly not like most Mondays. "To have this many people come out is pretty special - we're ranked one and two in the world so a match like this can really promote the game in China." McIlroy, who lost by six shots when the pair last met in Turkey two weeks ago, commented: "I think it was pretty exciting for the fans and it would be great to compete more with Tiger like this - maybe down the home stretch in the majors." Neither player is staying on in the country for this week's WGC-HSBC Champions at Mission Hills.